Its decent but not really for Dx'ing. I've owned a couple of R1000's. The rig has a 'regal' reputation (5-stars almost every where you look) that I don't believe it deserves. Its ok, its decent, but definitely isn't one of the quieter receivers you can have. Seems to have much white noise coming from the synthesizer. As a result weak utility stations usually don't come through too well on this radio. Selectivity is ok -- not bad but nothing to rave about either. Overall sensitivity is fair to good. The R-1000 has its die hard fans, but if you want a no frills receiver that's high-performing I honestly think the Lowe HF-150 is a better choice. A very no thrills rig for seasoned DX'ers, but still a great rig for beginners, and just a fun rig to tune. Yeah, not the most sensitive, not the most selective, but very, very, easy to operate. Definitely add-on an EXT speaker to take advantage of its audio quality. This rig may drift almost 500Hz, but rock solid after a 30min warm-up. Only a big deal with SSB and CW. The power supply built-in does add to the heat of this rig, and if you can run it with EXT +12VDC, it would be best to do so. (This is probably one of the biggest 1980's Kenwood gripes is their power supplies.) Kicking myself for getting rid of this rig 20 years ago. Still, if you're looking for the perfect shortwave starter rig for yourself, a friend, and even your kids, this is the rig to get. Biggest gripe? No FM, but you can still do slope detection for that. Only had mine a few months (got it on Ebay). It is mint and works like new (lucky me!). Well built with good layout. Easy to use. Not quite as sensitive as my new Tecsun PL660 but then it is about 40 years old! Top speaker gives decent audio - no need for an external. No BFO or fine tune, but the tuning dial is well geared and silky smooth. With a fairly steady hand one can separate SSB quite well. Estimating the value of a rig can be challenging. 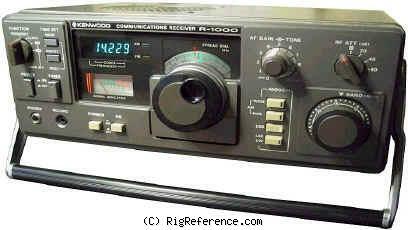 We collect prices paid by real hams over the years to help you estimate the current value of the Kenwood R-1000. Just bought or sold this model? Let us know what you traded it for and help other ham operators!